Brick Street Bakery wins ‘Sweetest’ title! 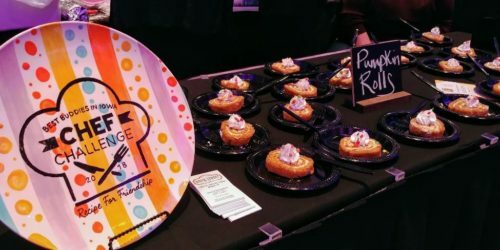 Brick Street Bakery participated in the 2018 Best Buddies Chef Challenge on Thursday evening and was awarded the top prize in the "Sweetest" competition. "It is an honor and joy for our Brick Street teams to participate and support this wonderful organization," said Bakery Brick Street Business Manager Peg DeLoriea. The Brick Street Bakery team made pumpkin rolls from scratch for the contest, with bakers and job coaches learning to assemble, mix and bake the rolls. Attendees raved over the pumpkin rolls, some returning for a second and third helping. This is the 5th year Brick Street Bakery has participated in the event. This is the second time Brick Street Bakery has been named the 'Sweetest." The competition is a major fund raiser for Best Buddies Iowa, a non-profit organization serving people with and without disabilities. The Brick Street businesses became involved with Best Buddies after John Kielgl, then director of Best Buddies Iowa, visited Brick Street Café for lunch and learned about Optimae’s mission of one-on-one job coaching for adults with disabilities. Also representing the Brick Streets at the event were Sadona Mondabough, Brick Street Bakery assistant manager, Kiersten Pryor, Brick Street Books and Café assistant manager, and Brick Street Books and Café employee Cara Kazor. "I want to thank the Brick Street Bakery team for their hard work and assistance making this happen, and to Kiersten and Cara from the Brick Street Books and Café, assisting at the event," said DeLoriea. "Our Brick Street teams are amazing and do an awesome job supporting our bakers and café employees."